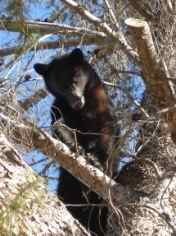 The Arizona Game and Fish Department on June 21 successfully captured and relocated a yearling male black bear that was treed between Buffalo Solider Trail and Seventh Street on the north end of Sierra Vista. The bear, weighing 75 to 100 pounds, was darted with a tranquilizer, then transported to the Gailuro Mountains and released unharmed. A tarp was used to break its fall from the tree. Game and Fish continues to remind Sierra Vista area residents (as well as other residents and visitors to areas in Arizona containing bear habitat) to be "bear aware," keep food sources stored away and inaccessible to wildlife, and secure garbage indoors or in a fully enclosed area until the day of pickup. Bear habitat on the eastern slope of the Huachuca Mountains was adversely impacted by the Monument Fire in 2011, causing some bears to forage for food in residential areas. Most recent bear sightings in the area involve yearlings, which lack established territory and tend to be displaced by older bears when food is scarce.